The fourth day of competition during the U16 FIBA Europe European Championship is the moment when the competition takes off as the players have become familiar with the environment and the demands of the competition. From Group E, Sweden and Russia maintained their unbeaten records and have qualified already for the quarter-final. Belgium also added another win to their record and have one foot in the quarter-final. In Group F, the hosts Italy had a good day beating France while Spain and Turkey booked their places in the quarter-final. In the first round of games in the relegation group Serbia beat Poland (69-54) and Croatia won against Finland (76-54). You may read the stories of interest by selecting the link below on the news from day four of the 2011 FIBA Europe U16 European Championship for Women Division A.
Italy out-hustled France at the key moments during the first 20 minutes that enabled them to build up a 10-point lead going into the locker room (37-26). Cecilia Zandalasin (left) was inspirational for Italy with 17 first-half points. The absence of Clémentine Morateur hurt France as they were not able to inject enough pace into the game but more importantly her defensive skill was missed. France were able to stay in touch during the first quarter because of their three-point shooting and never-say-die attitude of Assistan Koné. Yet things started to go wrong for France in the second quarter when the Italians started to play zone. France managed just 5 points from open play while the 6 remaining points in the quarter came from the free-throw line. Zandalasin from Italy continued from where she left off before the break. Her side went on a 10-0 run which included treys by Sofia Marangon and Sara Crudo as Italy stretched the advantage (47-29) with 23 minutes played. 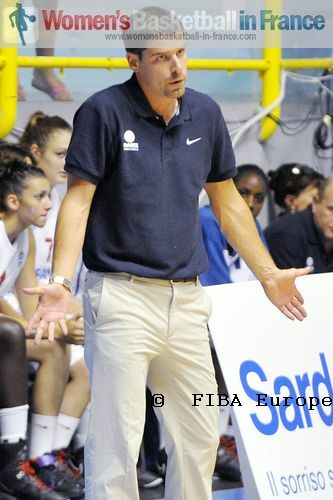 Julien Egloff (right), the French coach, was lost for words and called for a time-out just after Koné ended the French field goal drought. After the time-out France played better. However each time they turned the ball over Italy managed to score. So France went into the final quarter trailing (41-53). It was not a case of Italy pacing themselves to victory. Instead they maintained a solid defensive wall which forced France into taking long distance shots which they missed. Italy hit on the fast breaks and on turnovers as they went on to win (70-51). Elisa Penna and Marangon (5 assists) also finished in double digits with 17 and 16 points apiece for the "Azzurri". France had a poor shooting day all round and also missed a total of 17 free throws (18-from-35). Belgium are not dancing at the moment. But they have one foot in the quarter-final after beating Greece (55-37). A 10-0 run in the first quarter put them in control of the game for good (12-2). Belgium, led by Hind Ben Abdelkader (in picture) with 16 points, paced themselves the rest of the way. The Czech Republic pushed Sweden all the way in a bruising encounter. The teams were tied (48-48) as the game entered its last minute. Emma Erikkson (14 points) from Sweden broke the dead lock with a three-ball with around 45 seconds left to play. In the end the Czech Republic had no choice but to foul to stop the clock as time was going. Sweden went 2-of-4 from the charity stripe as they hung on for victory (53-50). Gabriella Hanson led the Swedish attack with 15 points while Sarah Beránková was the best scorer for the Czech Republic. Russia trailed by 4 points going into the final quarter against the Slovak Republic but ended up coming out on top after a 20-9 blitz (60-53). From this group Russia and Sweden are guaranteed a place already in the quarter-finals. Spain continue to roll over their opponents, with the Netherlands as the victims this time. Spain needed 17 minutes to get going. Then it was one-way traffic for almost ten minutes as they went on a 23-0 run to kill off the game as a contest with four minutes into the third quarter (50-23). Maria Arrojo led the Spanish team with 21 points as they strolled to another win (77-46). Turkey remain perfect after a tricky match against Hungary (51-42). Hülya Coklar was the player of the match with 23 points, 16 rebounds and 5 steals for Turkey. For Spain and Turkey the dream continues for the U17 FIBA World Championship for Women qualification as they are assured a place in the quarter-final. Serbia got the win they wanted as they fight to keep their Division A status. Poland had the better of the first 20 minutes and went into the locker room leading (34-29). Serbia switched tactics in the second half and started to play more collectively as well as making more free throws. They regained the lead by the end of the third quarter and then blew Poland away in the final quarter to win (69-54). For Serbia Sanja Mandic was everywhere scoring 19 points, 3 assists and 3 steals. A strong second and third quarter by Croatia was all that was needed to overcome Finland (76-47).